Brains. We need them. Ideally in top form. So it is no surprise that athletes, parents of athletes, and the general public is disconcerted by the frequency of concussions. In fact, it is a top reason for sports-related E.R. visits. And what can homeopathy do about it?! Homeopathy happens to be excellent at reducing inflammation and swelling. * It also has the advantage of being extremely portable so you can take it ASAP after the offending injury. In fact, that’s a key reason my G4 Kit is so small. With a small kit, we can take it most anywhere, so we have access to the remedies we need when we need them. The sooner we get started on our healing, the better. So take a dose while en route to the E.R. Head Injuries was born of the desire to prevent head injuries from resulting in concussions. 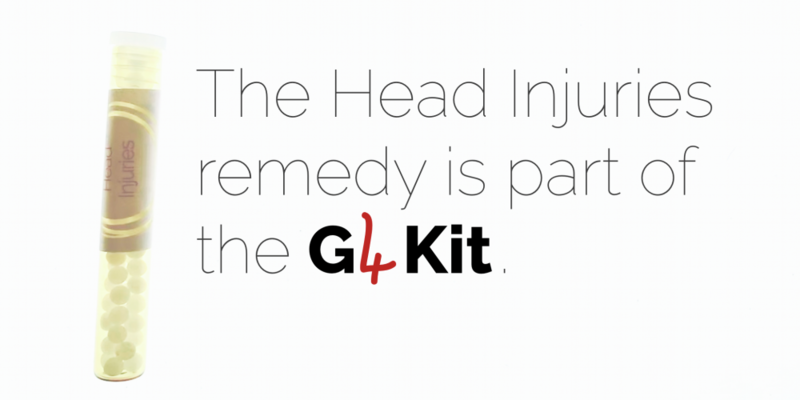 The G4 Kit contains two remedies for emergency situations–Major Injuries and Head Injuries. For a long time, I just used Major Injuries for serious head injuries, and First Aid / First Aid Oil for bumps to the head [and you still can–see below]. But a PRO client of mine had a friend who suffered a concussion. Seeing the fallout for his friend, my client asked for a remedy for concussion to have on-hand. Of course I gave it to him. But I decided then and there that I’d rather all my clients have a specific Head Injuries remedy to prevent the injury from developing into a concussion! It’s with you wherever you are. The sooner you get started with healing, the better. Head Injuries uses high potencies, so they are highly effective in emergency situations. Typically one dose is all that is needed. Head Injuries uses a combination of two remedies to address swelling and blunt force injuries. The little pillules are easy to administer to someone in an awkward position–just tuck them in a cheek or under a tongue. They dissolve quickly and get to work immediately–even before they’re fully dissolved. Thus far, the few clients who have needed to use Head Injuries report success–i.e., progressive disappearance of pain, swelling, and other symptoms. Why do I care so much? I care because that’s who I am and it’s my work to keep athletes in top form. I had an out of body experience for only a short period of time probably seconds. Although, when I first fell off, I had been sitting on the table backwards so I hit the back of my head. At first, it felt like a throbbing headache except it was radiating across my head. It went deep into my head and stayed like that for a little bit. Then, eventually I got the Head Injuries and First Aid Oil; it reduced to where it just felt like a large bruise. It contains Ledum in high potency. Ledum is highly regarded in homeopathy for its benefit to a person who has suffered an injury to the head. [Incidentally, it also is beneficial for black eyes for the same reason.]. Head Injuries also contains Arnica in high potency, which is great at reducing swelling, bruising. The combination seems to work. Thus far, the reports I have had from clients are all positive that they are able to avert a concussion by using the Head Injuries remedy. One client also used the First Aid Oil from the G4 Kit on the cheeks of the person with the injury to give an extra assist in bringing down inflammation. The added advantage of this choice is that both of my First Aid remedies include Hypericum, which is beneficial for nerve damage. If you suspect nerve damage, consider either adding the First Aid remedy or the First Aid Oil. My Major Injuries remedy simply contains Arnica 1M. This is a high potency Arnica that is used, for example, by plastic surgeons to reduce swelling, bruising, etc. that result from considerable injuries to the body. It’s well regarded in homeopathy for its ability to bring down swelling and is often used in hospital settings around the world as a standard for brain injuries. If you are out of Head Injuries or for some reason only have Major Injuries with you, it’s definitely worth taking for any significant injury for that very reason–reduce the swelling and inflammation, and buy yourself some time to get to the E.R. Don’t have a G4 Kit but want to try homeopathy’s healing power for yourself? My top recommendation is Arnica 200c, which you can buy from Amazon, many health food stores, or holistic pharmacies. Take a dose as soon as possible after the head injury [or any significant injury involving swelling, bruising, bleeding]. Then follow the dosing instructions given on the vial. *These statements not evaluated by the FDA. They are based on experience, common sense, and homeopathic principles. **Homeopathy has no known side-effects or contraindications.